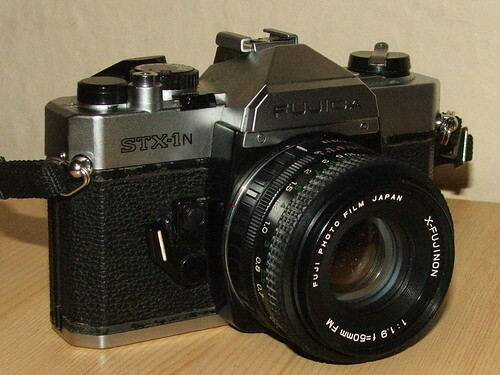 The Fujica STX-1N is a 35mm SLR made in Japan by Fuji, from c.1982. It has TTL metering, displaying as one green and two red LEDs in the viewfinder - replacing the meter needle of the 1978 STX-1. The interchangeable lenses were mounted with Fuji's X-bayonet. Shutter speeds 1/2 to 1/700. The Fujica MPF105Xn is essentially the same camera as the STX-1N.